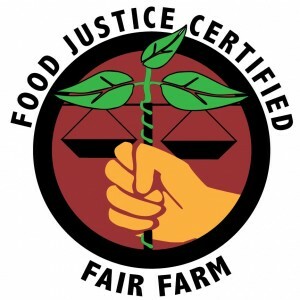 In the Northeast, the Agricultural Justice Project (AJP) has been providing technical assistance for farmers and food businesses, including workshops on creating a fair work place and certification for the Food Justice label. The Northeast Organic Farming Association (NOFA) is a founding partner of AJP, a collaborative, non-profit initiative to create fairness and equity in the food system through social justice standards for organic and sustainable agriculture. NOFA’s partners in AJP are Rural Advancement Foundation International (RAFI – USA), Comité de Apoyo a los Trabajadores Agrícolas/Farmworker Support Committee (CATA), and Florida Organic Growers/Quality Certification Services (FOG/QCS). A passionate commitment to social justice is one of the core values that inspired Ben Shute of Hearty Roots Farm in Hudson, NY, to become a farmer ten years ago. 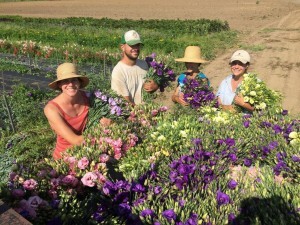 As Hearty Roots has grown, Ben found himself an employer, so he turned to AJP for technical assistance in creating employee policies for the farm. At the advice of AJP, Ben created a written set of labor policies for the farm, set up a file on each worker and instituted regular check-ins that are now monthly. At these check-ins, he or his farm manager review the goals that the employee has set for learning and for improving performance, and ask what further support they need to meet their goals. This process gives the managers the chance to provide regular feedback to the workers and for the workers to give the managers feedback on their management style. The check-in also allows some time to talk about the bigger picture of what is happening with the farm. Old Friends Farm is owned and operated by Missy Bahret and Casey Steinberg, and is located in Amherst, Massachusetts. Cut flowers are one of their cash crops. Alyssa Bauer, who works at Old Friends Farm, a 28-acre certified organic farm in Amherst, Massachusetts, heard about AJP two years ago from farmer friends who initiated the Agrarian Action Network, a group of young farmers and farm workers who want to improve working conditions on area farms. Alyssa had never heard of domestic fair trade and was excited to learn that there was a national movement to improve farm prices, and labor policies and practices. She read the Food Justice standards and realized that Old Friends Farm was already compliant with most of them. No full-time child labor, but rather carefully supervised participation of children on farms. The AJP website offers the full standards, policy manual, and a tool-kit with resources to help farms comply with the standards, all available at www.agriculturaljusticeproject.org. Alyssa sat down with farm owner Missy Bahret and fellow worker Ona Magee and reviewed the FJC checklist. Whatever was missing, they added to the employee handbook for the farm, and Alyssa highlighted these with the other workers at their spring orientation. Since they did not have to change much, the process was easy. Old Friends is interested in certification and is hopeful it will be part of a broader campaign for labor rights in the area. Although fairness has been a basic principle in organic agriculture throughout the years (see the International Federation of Organic Agriculture Movements Principles of Organic Agriculture), organic standards in the US have focused on production practices for farming and processing. The Food Justice label brings attention to the importance of fair pricing for farm products that fully covers the cost of production and the need for respect and living wages for all jobs in the organic supply chain. Brown sums up the hope of movement for domestic fair trade that as the public becomes more aware of farm worker realities, more people will be willing to pay the few extra pennies a pound and dollars a year that add up to a significant improvement in farmer and farm worker wages. The AJP process has earned positive evaluations from the Domestic Fair Trade Association (DFTA, http://fairfacts.thedfta.org/full-comparative-analysis), and from Consumer Reports (www.greenerchoices.org/eco-labels/label.cfm?LabelID=323). If you think you farm is ready or if you want more information to get you started, contact the author of this piece.